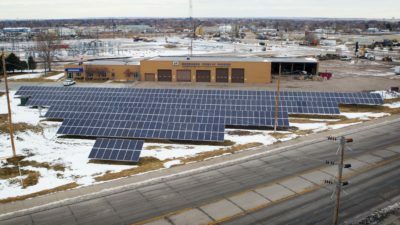 SCOTTSBLUFF — Scottsbluff could realize some of the lowest electric rates in the nation under an agreement that will bring solar power to all city operations. During its Monday meeting, council members approved a lease agreement with Sol Systems, LLC as part of the city’s five-megawatt solar power project. Sol Systems would then enter into an energy purchase agreement with Nebraska Public Power District for distribution of the solar electricity. NPPD Photo: Scottsbluff Community Solar Project. Through NPPD’s SunWise Program, a total of 135 solar shares were available. Each solar share = 150 kilowatt-hours per month, the minimum participation level. The maximum participation level was the number of solar shares equal to 80% of a customer’s total annual energy consumption. For example, if a customer used an average of 1,000 kilowatt hours per month, 80% = 750 kilowatt-hours or up to five solar shares. All 135 solar shares were spoken for, and customers are now placed on a wait-list. See Solar Examples for additional details. South Sioux City Solar Farm: 2.3-megawatt array (1,200 panels) located on a 21-acre solar park south of the city, alongside C Avenue. The array generates enough energy to provide 5% of South Sioux City’s electrical needs. This is the first Nebraska project for California-based developer Solar City, a Tesla Motors subsidiary. Tesla Energy is now mainly using its own ‘Tesla-branded’ solar panels made at Gigafactory 2, Electrek. While we are waiting for Tesla to ramp up its solar roof tiles, the company is starting to use more of its own solar modules. A new report shows that Tesla Energy is now mainly using its own ‘Tesla-branded’ solar panels made by Panasonic at Gigafactory 2 in Buffalo. This entry was posted in Nebraska / Midwest News and tagged City of Scottsbluff, Clean Energy Finance Forum, electric buses, Nebraska Community Energy Alliance, Scottsbluff Star Herald, solar energy development in Nebraska, SolSystems, South Sioux City, Tesla solar roof tiles on November 6, 2018 by Helen Deffenbacher.